CNBC has confirmed it is renewing Jay Leno’s Garage for a second season. As reported last week, the first season of Jay Leno’s Garage was CNBC’s most-watched new series. The thought of cancelling the series did not rev the cable network’s motor. Season two of Jay Leno’s Garage consists of 12 new, hour-long episodes. The second season is set to premiere in the spring of 2016. ENGLEWOOD CLIFFS, N.J. – December 3, 2015 – After a record-breaking first season, CNBC today announced the network has renewed “Jay Leno’s Garage.” Season Two will return with 12 original hour-long episodes in Spring 2016. The show wrapped up the most-watched freshman season in network history last night. To learn more about “Jay Leno’s Garage,” visit http://jaylenosgarage.cnbcprime.com. Like us on Facebook https://www.facebook.com/jaylenosgarage, follow us on Twitter https://twitter.com/LenosGarage and Instagram https://instagram.com/jaylenosgarage. 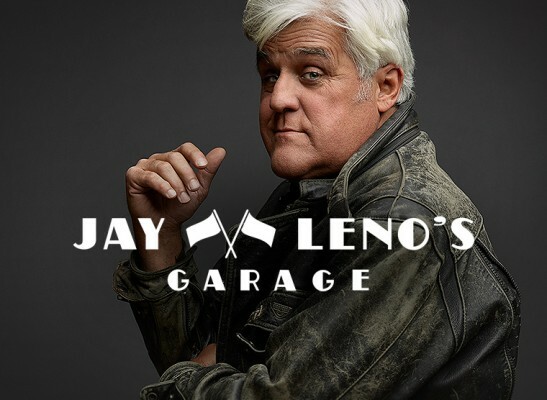 “Jay Leno’s Garage” is produced by Original Productions, a FremantleMedia Company, and Kitten Kaboodle, with Jay Leno, Philip David Segal, and Jeff Bumgarner as executive producers. Jim Ackerman and Adam Barry are the executive producers for CNBC. With CNBC in the U.S., CNBC in Asia Pacific, CNBC in Europe, Middle East and Africa, CNBC World and CNBC HD, CNBC is the recognized world leader in business news and provides real-time financial market coverage and business information to approximately 386 million homes worldwide, including more than 97 million households in the United States and Canada. CNBC also provides daily business updates to 400 million households across China. The network’s 15 live hours a day of business programming in North America (weekdays from 4:00 a.m. – 7:00 p.m. ET) is produced at CNBC’s global headquarters in Englewood Cliffs, N.J., and includes reports from CNBC News bureaus worldwide. CNBC at night features a mix of new reality programming, CNBC’s highly successful series produced exclusively for CNBC and a number of distinctive in-house documentaries. The Original Productions team, led by Philip D. Segal CEO & EP, is a world-wide culture-changing force in unscripted reality television. More than 180 countries world-wide watch Original Productions’ shows. With titles such as Deadliest Catch, Bering Sea Gold, Ice Road Truckers, Ax Men, Storage Wars, and Appalachian Outlaws, they will produce 250 hours of ‘original’ programming in 2015. For all things ‘original’ go to http://www.origprod.com/. Jay Leno, Executive Producer and CEO, is a well established entertainment enterprise, producing the Tonight Show with Jay Leno for 22 years, producing and managing Jay Leno’s Comedy Stand-up appearances as well as voice over, film and television appearances. Kitten Kaboodle owns Jay Leno’s Garage series. Source: Nielsen. Based on Live+SD average audience among P2+ and P25-54. Prime time: Monday-Sunday 8-11P. Jay Leno’s Garage: Wednesday 10/7/15-11/25/15, 10-11P ET. What do you think? Have you been watching the Jay Leno’s Garage TV show? Do you agree that the series deserved to be renewed, or do you think it should have been cancelled? Great show – so good to see him again and his cars – Great great show!! !